Each question includes a concise, easy-to-follow explanation in the answer key. You can use these questions to supplement your overall AP Biology preparation or run them all shortly before the test. 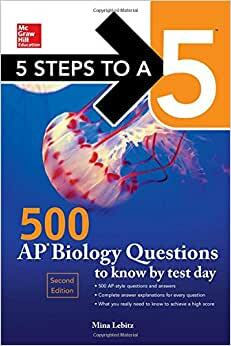 Either way, 5 Steps to a 5 500 AP Biology Questions, 2ed will get you closer to achieving the score you want on your AP Biology exam. Mina Lebitz taught AP Biology and Science Research at Brooklyn Technical High School and received the New York Times' Teachers Who Make a Difference award. She tutored at a premier test prep agency in New York for several years and now freelance as a science tutor for students competing for Ivy League colleges. Excellent prep book for the serious AP Biology student. Very well written and illustrated. Answers are clear and understandable. Students truly interested in the subject matter and aspiring to achieve a "5" should find great benefit in this 2nd edition. Recommended by a friend, did not go through all yet. Questions are no where near the level of difficulty of the actual AP test. I would not recommend this book for practice. A lot of questions are way too confusing and the explanations don't make sense. It does not match actual ap questions.